They say that heroes leave behind a little part of themselves in each of us. I don’t know if that’s true, but I want to tell you why I wish I’d met Matt Schnirel, who I think was a hero. And he’s not the only one either. Singer songwriter Jack Johnson asked: “Where’d all the good people go? I keep changing channels. I don’t see them on the TV shows…” But–if heroes surrounded us every day, they wouldn’t seem heroic, would they? Why? Because heroes are rare. And, they make you aspire to be a person of integrity. Someone you hope you can be. Michael Doran was a fantastic trial attorney from Buffalo, and a professional friend of mine. He hired Matt Schnirel right out of law school to work at his small law firm. He didn’t hire him because he finished at the top of his class. He hired him because he had clerked for his small law firm in Buffalo, and everybody that met Matt loved him. Michael was a very successful, persuasive attorney in front of juries. And he was a great judge of a lawyer’s character. I was as shocked as everyone in Buffalo that knew Michael and Matt when I heard the news that Michael Doran’s small Cirrus plane crashed in 2009 after it took off from a municipal Cleveland airport, after Michael and Matt had attended a hearing there. Something went horribly wrong right after take-off and Michael tried to get the plane back to the airstrip when it crashed not far from the airport. And, it was one of those planes with a special parachute that can be deployed, but only after the plane reaches a certain altitude. I went to the funeral for Michael Doran, and that was where I heard a lot about Matt Schnirel, who was a new, young lawyer working with Michael’s law firm and who was the only other passenger who lost his life in the crash. Heroes don’t panic in life threatening situations. I learned a great story about Matt Schnirel after Michael’s funeral at a tribute for Michael and Matt. Matt and a group of his high school friends accidentally went down a wrong trail on a Jay Peak Vermont ski slope in 2003 on a frigid winter afternoon-ending up stranded at nightfall in a deserted valley with no ability to get out (and no cell phone service). Night fell, and the temperatures dropped to 30 below zero, and as each hour passed they all became more and more desperate. One lighter proved pivotal—Matt and the others broke off tree branches and built a fire and continued to feed it hour after hour, fighting off frostbite. At dawn, Matt led his friends to try to find their way up and out of the valley, and during that effort rescuers found them. Matt Schnirel retold this story in his personal statement to Buffalo school of law in his application, and he was (you guessed) accepted there. Other heroes don’t help save anyone, but still are heroic. My late aunt, Annette Halprin, may never have “saved” anyone but she lived live with a certain savoir-faire, meaning she was adaptable, knowing what to do in any situation. She treated everyone around her with dignity, she was funny, and she was always someone who I looked up to. She’s another hero, and I was privileged to give a eulogy at her funeral. 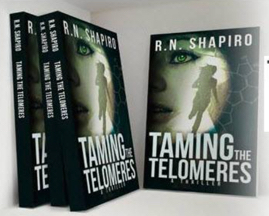 Perhaps that’s why I wrote about a hero named Amanda Michaels, the leading female character in my first fiction thriller, “Taming the Telomeres.” I am sure I infused a part of Matt and a part of Annette in the character development for Amanda. Though Amanda seems imperfect and perhaps not heroic at the beginning of “Taming,” she manages to pull through against her seemingly insurmountable obstacles after being the sole survivor of a jet crash. I wish I had met Matt Schnirel. We all have heroes. I’m sure you know someone like him or my aunt, and no, all the good people are not gone. They are just hard to find. Previous True or False Fun Fact: A telomere [tel-uh-meer] is a rare monkey found only in Madagascar?